Here is my take - to thank my Kid's Ice Skating Instructor for another great session of lessons!! I added Stickles to the Ice Skates & scarves; punched the edges with the icicle MS punch; sponged all around card's edge & topped it all off with light blue sparkly Rhinestones. Avril & Jennifer. Thank you both for your great contributions and for being a part of our Team. Please help us to welcome them to the team!! Check out the LOVELY Thankful Designs from the Design team & come join us --->; HERE! If you LOVE the adorable House-Mouse stamps, you have another chance to win some of these adorable stamps for adding to your collection ---> Simply enter the Midnight Madness Sketch Challenge Blog - because we (the HM& F MC Team), are sponsoring MMSC this entire month and we have some FABULOUS House-Mouse Stamps as prizes for the Lucky players! I love the icsicle border and the sparkle on this super cute card! I haven't seen this stamp yet, I love it! Wow, what a great card. It almost makes me want to turn up the heat in the house because it is so realistic that I get the feeling it's cold enough to ice skate outside. Love that border punch and your snowflakes are just the perfect embellishment. Thanks for sharing. What an awesom creation and love how you have added the icicles round the edge, it really gives the card dimension. Your card is perfect and I love it! fantastic image and so beautiful coloured. Love the lo and the colours on it. great with the stickles and the punched edge! Good luck and I hope to see you again! 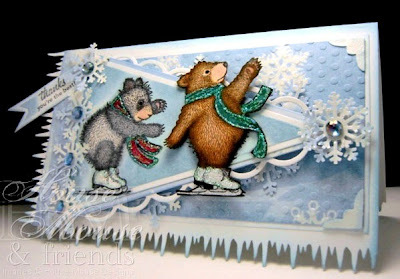 Gorgeous card - love the icicle border and perfect scene. Thanks for sharing it with us at Charisma and Allsorts this week. Such an adorable image, America! Love the way you made the border punch work. Fabulous design! So thrilled to be Guest Designing with such talent! Holy cow batman.... this is GORGEOUS! Oh my word.... love it girlie! Very clever idea with the SB as well! Wow this is gorgeous, what a fab image!! Thanks for joining us at Charisma Cardz. Hi America! I just love this card! Your coloring is outstanding on the bears fur and I love the snowflakes and icicles! Simply beautiful! Thank you for joining us at Fussy and Fancy for our, "Feature a Sentiment" challenge! Wowzers girlfriend this is adorable. Love the light icy blue and that icicle border (gotta have it) is fabulous. Your kids instructor is going to get such a smile from these two beginner bears on ice. Love it. Oh my this is ADORABLE!! Love how you have them going up the hill LOL too cute!! Love the icicle border and glitter. Thanks for joining us this week at Sweet Stamps, hope you will join us again for our next challenge. Fabulous image! Love how you've done the sentiment and the icicle edging looks so great. Thanks for joining us at MMCS Thank you challenge. Oh wow, what a splendid card and image! Cute image and lovely use of those sparkling ices! Love the Gruffies and that fantastic icsicle border! Oh wow !!! this is absolutely stunning !! I love this image and so perfect for a skating instructor !! the design is awesome !! Oh wow this is gorgeous. The icicles look fabulous and such a sweet image. Hellos you!!! Your card is your usual stunning self!!! Your design is fabulous and your colours and all the details are awesome. I do love those Gruffies and loving such fun and so sassy with his sparkly boots and scarfs. Fabulous card! Love the stamp and the sketch!! Great card! Thanks for joining us at Christmas Stampin' All Year Long! Such a sweet image! Love it! Thanks for joining us at SFC! Beautiful Card! Stunning coloring work! You are very talented. Thanks for joining us at I DID IT CREATIONS CHALLENGE # 80! Good Luck! FABULOUS!!!!! Those icicles really add to the frosty feeling. Gosh woman...do you think you could add a few more layers on that thing??? LOL! I seriously don't know HOW you do it...but if I put that many die cuts and layers of goodies on stuff...they would NOT look beautiful like your stuff. YOU ROCK!